A week off didn’t work out well for the ABC line-up. ABC: After missing a week for the AMERICAN MUSIC AWARDS, ONCE UPON A TIME returned to a new series low, down 0.3 from 2 weeks ago to 1.3. QUANTICO fell 0.1 to 1.2. 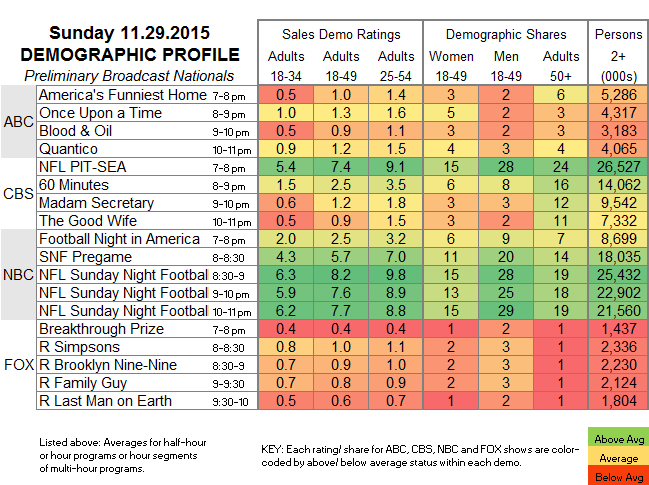 (BLOOD & OIL, however, which hadn’t aired since November 8, was up 0.1 to 0.9.) The night started with 1.0 (down 0.1 from last week) for AMERICA’S FUNNIEST HOME VIDEOS. CBS: The late afternoon NFL game pushed the line-up by an hour in most of the country, meaning that CSI: CYBER didn’t air in primetime. The shows that did air are subject to adjustment, but currently 60 MINUTES is at 2.5, MADAM SECRETARY is at 1.2 and THE GOOD WIFE is at 0.9. NBC: SUNDAY NIGHT FOOTBALL has a preliminary 7.8, up a big 2.2 from last week’s early number. FOX: After 0.4 for a BREAKTHROUGH PRIZE special, the network aired reruns, topped by 1.0 for THE SIMPSONS. Tonight NBC unusually airs back-to-back “preview” episodes of its January sitcom SUPERSTORE, in order to give it a shot at the post-VOICE audience, since that show will be in hiatus when the run actually begins. (The network will do the same thing next week for TELENOVELA.) FOX has the fall finale of GOTHAM and what will almost certainly be the series finale of MINORITY REPORT, CW has the fall finale of CRAZY EX-GIRLFRIEND, and ABC precedes the annual run of A CHARLIE BROWN CHRISTMAS with the commemorative special IT’S YOUR 50TH CHRISTMAS, CHARLIE BROWN. CABLE RATINGS: Come back early Wednesday for detailed demographic ratings for top cable programs from this day, later than normal because of the ratings delays caused by Thanksgiving weekend. While you are waiting for the cable numbers to resume, check out the new Audience Maps for all the fall broadcast shows.